Boost flavour and your health by adding fresh herbs to food. Here’s how rosemary, parsley, peppermint, oregano and thyme benefit your health. Here’s a great reason to keep a pot of fragrant rosemary in your kitchen: Recently, scientists at the Brain, Performance and Nutrition Research Centre in the U.K. reported that having higher blood levels of one of this herb’s main chemical compounds-absorbed from its aroma-was linked to the speed and accuracy of study participants’ cognitive performance. The higher the level of the compound in the blood, the better the outcome. 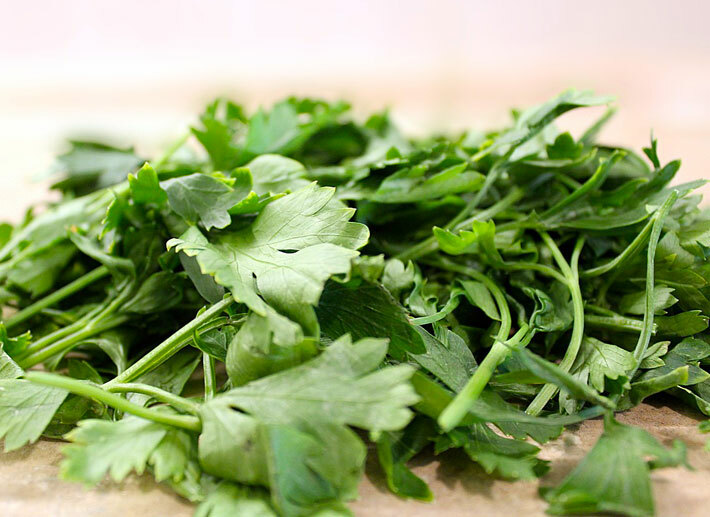 Toss parsley into salads for its high levels of apigenin. A study ?in Cancer Prevention Research showed that when rats with a certain type of breast cancer were exposed to apigenin, they developed fewer tumours and had delays in tumour formation compared to rats not exposed. Apigenin blocked the creation of new blood vessels required for tumours to grow and multiply. Research in the Proceedings of the National Academy of Sciences showed that when mice with inflamed paws were treated with oregano’s active ingredient-beta-caryophyllin (E-BCP)-the swelling subsided in 70 percent of cases. E-BCP links to structures in a cell’s membrane, inhibiting the production of substances that signal inflammation. Sprinkle fresh thyme on salmon or chicken that’s headed for the grill: Among fresh herbs, thyme has the second-highest amount of antioxidants (sage has slightly more), according to its oxygen radical absorbance capacity-a measure of a food’s ability to fight off disease-causing free radicals in our body. Thyme is also a very good source of vitamins A and C, as well as iron and dietary fibre. But the key to using fresh herbs is keeping them, well, fresh. Buy a big bunch of parsley or basil and toss it in the fridge, and it will more than likely be wilted and sad the next day. Not only is it a waste of food, but it’s also a waste of money. Don’t worry — storing them so they last far longer than 24 hours is actually easier than you think. Fresh herbs go bad because of a number of different factors. Too much moisture on the leaves can turn them slimy, while too little moisture can cause them to dry out. Also, excess light can cause fresh herbs to yellow, and excess oxygen (and sometimes very cold temperatures) can turn them brown. The key is to find the herb’s happy place among these four factors: moisture, light, oxygen, and temperature. All fresh herbs should be washed before using. Rinse the whole bunch under cool running water and dry them well — whether you’re after a sprig or a giant handful, it will be ready for you whenever you need it. Always wash fresh herbs with cool water and dry them properly to ensure there won’t be excess moisture lingering that could lead to decay. You can simply rinse the bunch under the sink and lay it out in a single layer on paper towels to dry, or try taking the herbs for a ride in a salad spinner.